full of heart-stopping adventure, romance and suspense. 1. A brief section of music composed of a series of notes and flourishes. 2. A journey by water; a voyage. Alexandra Bracken weaves a vibrant magical tale as a violin prodigy and a disenfranchised sailor embark on a precarious journey through time, across continents and decades, to search for an artifact with the power to both save and destroy lives. Etta and Nicholas’ adventure takes them to 18th century New York City, through war-torn London in 1940, to a blistering desert in Damascus (and more). 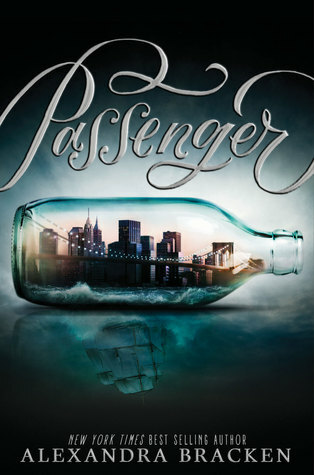 Boldly combining history, fantasy and romance, Passenger delivers a story of forbidden romance, of magic through time, of warring families and deep betrayals, of impossible choices and fraying hope. Bracken’s vivid world building coupled with a heart-pounding sense of urgency makes the story unputdownable. Even more enrapturing is a slow-burning romance between our two unlikely protagonists, both strong and likable, both faced with choices fated to thrust them apart. There are so many things I loved about the novel. The concept. The characters. The locations. The story’s pacing. The forbidden romance. Everything came together expertly, making it all too easy to devour the novel. We meet 17-year-old Etta Spencer the evening of her musical debut, but before she graces the stage, with a discordant sound and a fierce thrust, she finds herself on a ship sailing towards 1776 New York City. Suddenly, truths about her newfound ability, her ancestry, and a history of feuding, time-traveling families, catapult her into a frenzied and unfathomable reality. Aboard the ship, she meets Nicholas, a former slave whose leashed freedom extends only as far as his signature on a contract and a debt to a family that has stolen his worth, his family. When Etta and Nicholas meet, a connection full of promise sparks to life, but their unfortunate situation tethers them to an ill-fated reality. Etta is then taken to the man who holds her future in his dirty hands. She has days to retrieve a dangerous object for him, or else. Racing through time with Nicolas at her side, Etta deciphers her mother’s clues while devising a way out of her impossible situation. All the while, Nicholas and Etta’s intensifying emotions bring them closer together, despite not wholly knowing Nicholas’ true intentions. Together though, during quiet and shrouded moments, they are able to fully be themselves, able to love each other, regardless of the inevitability of their forsaken future. Suspense and romance duel delightfully in this exciting series opener. The novel ends with a heart-stopping finale which promises even more danger and intrigue. I cannot wait to read book two, Wayfarer. For now, know that this is a novel that shouldn’t be missed. It’s already one of my favorites of 2016! Really enjoyed this book also – looking forward to the sequel!